"Yoshinari Nakamatsu / Given Holiday"
availble from September 16, 2009 at iTunes Store in the world. A live recording by Mini Disc, stereo sound, 3 days after 911 at laguna Beach in Caliornia on Sepetmeber 14, 2001. Released as the second EP on September 16, 2009 as digital format from DNR. The peaceful kids scremings and the sound of the beach were calmly settled in Laguna beach, CA, on Septmber 14, 2001. Beside the contrast of the terrorism at that time, the three live tracks with the full of the amibiences were recorded by a mini disc recorder, which is similar to the method of documentary photo. A week later in Tokyo, the flute (Kazuo Yoshida) was added without any rehearsal . これは 親の家業を引き継ぐために帰郷する友人の送別会の為に2004年に作った曲です。ラブソングにも聞こえますが、友情を歌った曲です。エンディングは2008年に足したもので、2006年にタヒチに行った時の爽快感をイメージして作りました。全て、最後は報われる、というような気持ちで。。。個人的に、裏でうっすらと鳴っているエレキギターのフィードバックや、コードが２つしかないのに歌のメロディが展開していき、途中でギターのリズムパターンがパルチードアルトに変わるなど、細かいところが多いですが、目立たないところにこだわりました。演奏参加者：吉田一夫（フルート）、新留香（コーラス）。This song was a farewell song written in 2004 for my friend who had to go back to his home town due to cary on his family business. It sounds a bit love song, but it is truely for the friendship. I added the ending part in 2008, which my Tahiti trip in 2006 inspired the image of "release," implying all ends up to end nicely. There are many little tricks in this track, a guitar feed back sounding like violines, having only 2 chords but the vocal melodies changing, the guitar rhthm pattern changing, etc. Guest Musicians: Kazuo Yoshida (Flute), Kaori Niitome (Vocal). この曲は1999年から2003年に撮影された米国シングルマザーのドキュメンタリー写真と生演奏を融合する独自企画「PHOTOACTING」の為に作ったサントラで、シングルマザーAmyのモデルに成る夢について語った曲です。東京とアメリカを行き来する中、東京の町中に溢れていた西洋モデルの広告のように、いつか彼女も「どこにでも居る」存在になるのでは、という希望の歌です。参加ミュージシャン：吉田一夫（フルート）、安藤昇（ウッドベース）、六反征吾（パーカッション）、草刈洋子（コーラス）This song was written as the sound track for my own project, PHOTOACTING, comining a documentary photos of an American single mother and a live music, made between 1999 and 2003. The single mother had a dream to become a model. Going back and forth between America and Tokyo, I got a vision she can be "everywhere" just like the adds on the street of Tokyo. So this song is a hope for a dream. Guest musicians: Kazuo Yoshida (Fulte), Noboru Andoh (Acoustic Bass), Seigo Rokutan (Percussions), Yoko Kusakari (Chorous). 2007年５月より始まったインターネットラジオ番組「Cafe De Yoshi」のオープニングテーマソング。Pastelを作っている時期に作りました。元々このアルバムは１２−１３曲入りのフルアルバムのつもりで２００５年あたりから作っていて、一日24時間の日の光、時間軸に合わせて曲が並ぶ、という構成でしたが、結局、朝から日中、夕方までぐらいに留まったかな、と思います。しかし、この曲は1曲の中でで日中、夕方、そして日が暮れて星が出てまた朝が来るような構成になっているような気がします。The openig theme song for the internet radio show "Cafe De Yoshi," started on May, 2007. It was written around the time of PASTEL. This EP had been made since 2005 and supposed to be LP and had 12-13 songs and showing the movement of the Sun light for 24 hours. In this song, it completes to show the time change from sun rise, daylight, sunset, and evening. 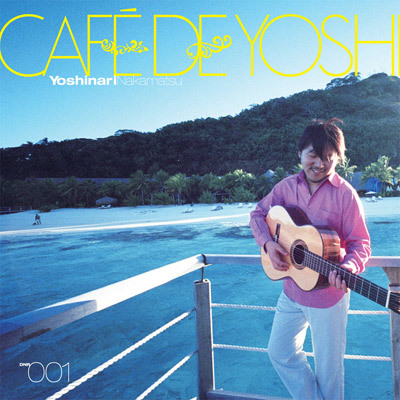 Yoshinari Nakamatsu's 1st solo EP "Cafe De Yoshi" is released from his own new label, DNR, on July 7, 2008. The EP contains 6 songs including "Eternal Light," the theme song of his internet radio show "Cafe De Yoshi." The concept of this album is "Brazilian music meets Oceanian music." Yoshi seeks to music which makes listeners to feel and imagine resort in oceania like Bora Bora in Tahiti, day light, sound of beach, etc. "Cafe De Yoshi" EP contains 6 tracks, chosen from the past between 1998 and 2005, all music and words written by Yoshi and re-record and re-mixed for the album. Yoshi sings most of the vocals and plays most of the instruments and mixes 4 songs by himself. The tracks are mixtures of samba, bossa nova, with hip-hop beat, samba beat, etc. "This is an accumulation of the 35 years of my life. I've never done such serious recordings in my life. -Yoshi"
For those of who would like to purchase this CD, please send an E-mail to the following address. 1998年作曲。元々日本語詩で、フォーキーなロック調のビートルズを感じさせるような曲調でした。2006年のある日、友人が日本語の歌を歌っている僕を観たいというので、 昔作ったこの曲を引っ張りだし、当時２４才で音楽的教養の無い僕を８年経ったプロデューサーYOSHIがボサノヴァ風にremixしてしまう、というコンセプトで、３日間で仕上げたのがこのトラックです。このアルバム制作の中で最後に作業した曲で、2007年から親交のあるスウェーデン人ボサノヴァシンガー、ヨハン・クリスター・シュッツにカバキーニョ（ブラジルのウクレレ楽器みたいなもの）を弾いてもらってます。ネット時代ということで曲のデータをE-mail、Skypeでの打ち合わせとなりましたが、素晴らしくウキウキさせてくれるスパイスを入れてくれたと思います。歌詞は遠距離恋愛の歌で、見上げた月が欠けたカタチが寝ている恋人のヒトミのように見え、彼女のことを思うという、月が大好きな遠く離れた恋人に向けてのメッセージです。Originally written in 1998 , it sounded like acoustic folky 60s-70s beatle rock. In 2006, my friend asked me what if English singing Yoshi would sing in Japanese. So, I pulled from an old stock written by an uneducated young boy, what if a Brazlilian producer Yoshi would produce him. It took 3 days to be remixed and it was this. This track was the last song I worked on in this EP. I asked a Swedish Bossa Nova singer Mr. Johan Christer Schutz to play Cavaquinho (Brazilian Ukulele) thru e-mails and Skype. It adds the song to have the resort feeling to raise my heart up. The lyrics is about a long distant love affair. Seeing the Crescent in the sky as the lover's sleeping closing eye. It was a great joy and a message to a far distant lover. 2003年に某企業のラジオCM用の音源コンテストがあり、約２００曲の中から３位に入賞された楽曲。近年のライブでは定番でやってる曲ですが、公式リリースは今回が初。This was originally written for some competiotion of a commercial on a radio, about 200 songs were applied and this got the 3rd position (never used). Yoshi's recent "resisdent" song in his show but never be released. The digital version only available as a bonus track. 2003年に既にこのremixヴァージョンが作られてましたが、公式リリースは今回が初です。間奏のギターソロは2009年6月に収録。ミックスダウンは2009年6月に行われました。This remix version was already made in 2003 but never be released. The guitar solo was recorded in June, 2009. Also, the final mix was done in June, 2009. The digital version only available as a bonus track. 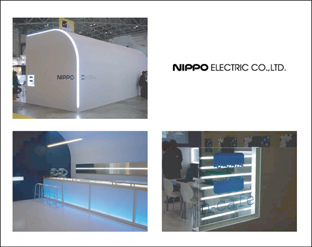 The sound tracks for Nippo Electric which exhibited at Lighting Fair 2001 in Tokyo Big Site in March, 2001. Yoshinari Nakamatsu wrote the songs (instrumental) and the string arrangement, played guitars, synth, programmings, and produced. The songs were played in the "cafe" styled futuristic booth and the 2,500 corporate CD-ROMs were given away at the exhibition.